Windsor is Elegant Layered Jacquard Valance, by Stylemaster 56"W X 17"L, Valance will fit standard 2 1/2" wide pocket curtain rod and 1 1/2" header. Cotton/Poly blend, machine washable. Top layer of striped fabric, bottom layer of solid coordinating fabric. Debated on installing full length curtains but decided to use these. Perfect! ProsEasy to install; Looks great! I love my new curtains. They make may triple kitchen windows look really good. Curtain is made of good quality material and hang beautifully. I would highly recommend them. valance and am pleased with it. Exactly what I wanted. I love them. I love the valances. They look really nice. ConsThe color was a little off of what I thought it would be but I still like them. I love these curtains! They are very well made and the Olive color matches my decor beautifully. Very pleased with this purchase. Nice earth tones n nicely made. I ordered 6 valances and they look absolutely stunning and the material is more than i expected. Very pleased with this purchase. They are full and high quality material and workmanship. Will definitely shop Swags Galore. Shipment arrived before indicated. Very pleased customer. Well-made. Color is darker than shown in the catalog, but I will keep it. ProsWell made. Didn't expect them to be lined. ConsWas expecting a lighter blue. Price was great! I love these they match perfectly wanted to buy one more, but the shipping was too much. Perfect match. Great quality and looks amazing!!! They came just as they looked online. I love them. These are great valances & value. They look wonderful in our bedroom! So glad I found this company! I was very pleased with these valances when I received them. I did not expect the quality to be as nice as they were, especially for the price. They are in my dining room over sheers that I have and look very nice. ProsLook nice, came on time undamaged, no problems. I am happy with the purchase. The curtains are an olive green and gold (wasn't sure from the online photo) and they also have a bit of a sheen/shine to the finish (couldn't tell that from the photo either). They look nice on my corner windows in our master bath. The only negative is the finish at the bottom of the valance is a bit large and it's hard to keep it tucked on the backside (even after ironing). This is the 4th pair of valances I have ordered! Will definitely keep Swags Galore in mind for my next purchase and will refer my friends. Exactly as stated and very well made. A great bang for the buck. Very happy with the valances. They look great in my family room. 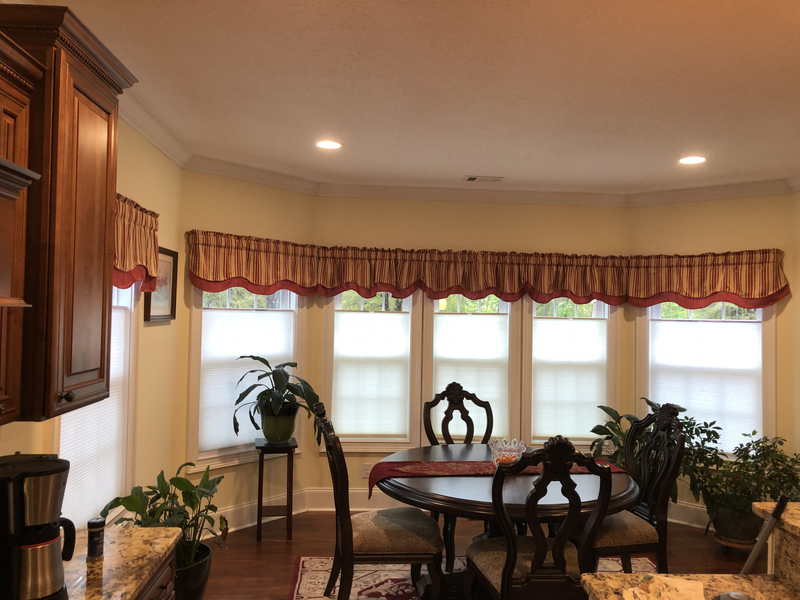 Swags Galore was very quick with delivery and customer service was great when I had to send two valances back because I only needed six and had purchased eight!! I really like the color and style of the valance. However the hems are not neat. They are frayed and don't look neat. Otherwise I would have given them a 5 star rating. The curtains are beautiful and hang so nice. The price was really good for the quality. Was very Leary what quality would be for $12.99 each. They are BEAUTIFUL and the quality is beyond my expectations! Great Customer Service. Will definitely use again and tell all my fiends! Absolutely love the valance that I selected! This was my first time purchasing from Swags Galore and I couldn't be happier with the product that I chose. It matches the paint colors in my kitchen perfectly! Ordering was quite easy and came in about a week's time. They also ironed up beautifully. I will probably use this site again when I am ready to purchase for my other rooms in the house. Ordered 10 valances and received them within a couple of days. Very impressed with the quality of the product !!! Their prices were very reasonable. They are beautiful and I look forward to purchasing more window coverings in the near future. I wont shop any where else now that I have found Swagsgalore.com. Colors were excellent. Exactly as I wanted. Stands up vewy well after ironing. I love the curtains! I like the two tier curtain look. Very nice. Nice material, fast shipping. Would buy again from Swagsgalore. Color as stated in picture, nice..
ProsVery nice with two valances,..
ConsBottom hem needs to be deeper to keep from turning up, even after being ironed. As soon as I saw them online, I knew they would be perfect. Ordered easily, came so quickly I was amazed, didn't order enough so ordered two more and they came in like three days! They needed ironed but that was OK. They look great on the windows and hang nice. The material is heavy and I think they will last long time even with washing. This is fourth order I have put in and all the curtains are perfect. These curtains are great, and at an affordable price. These look extremely good at my windows. They are of good quality and are exactly like the picture. I love these valances. This is the 4th time I have purchased from Swags Galore! I have been happy with everyone of my purchases. Delivery was quick also! This will not be the last time I will order from them. Good quality product for a good price! Highly recommended!! Would recommend to anyone. Valances greatquality and just as described. On here to order more for other windows. Perfect color and length for my kitchen windows. was very surprised how well made they were, very pretty. will buy more.as with anything in a package, you will need to press,steam iron is best. Very nice curtain. Love the way it goes with the room. Very nice valances. Lined, very pretty. Well satisfied. ProsColor good and lined, machine washable. Very impressed with the quality of this valance and the excellent price. I used three valances on a 52 inch window and they look custom made. ConsDid not get an email confirmation. Quality of valance very nice..Price was excellent! ProsI couldn't find anything I liked else where. I love these valances. The sales people were nice and friendly and discounted the coupons before I mentioned them. A huge selection at a great price. LOVE THE COLORS AND FABRIC! Great quality for a reasonable price. The Windsor Layered Valance is Lovely! The Windsor Layered Curtain Valance is just as it appears on the web picture. It is made of nice material and is well made. I like the way the ruffle wriples when on the rod. Great purchase for a great price! ProsWell made; nice material; arrives just as it looks on the web page. Good price. After ironing they are beautiful in my kitchen. I was looking for valances that had color (not just solid) & I found them at Swags Galore. They go perfect with my newly painted & decorated kitchen. Very true to picture, absolutely beautiful. Prosexactly like picture and what I needed. Great selection and prices!. Good service. Will reccomend to all my friends. I wasn't sure when I saw them in the package, but when I took them out and pressed them....I fell in love! They look fantastic! These were exactly what I was looking for! Colors were as shown - quality excellent - good wokmanship - more than pleased with this purchase! It was very easy to order online. They came in a timely manner and they look absolutely beautiful. I purchased this valance as a topper for pleated drapes over 2 sliding doors to a terrace. The valance was high quality, needed only ironing to hang nicely, and its colors perfectly matched the colors portrayed on your website. Thank you! Really like my new valances. Was also impressed with the very quick delivery. This valance was more than suffcient to fill up the top of the window.. I ordered two because I wanted it to be very full. I am returning one since I don't need it. You will be pleasantly surprised when you receive them after ordering. ConsNothing wrong with them at all. I love my curtain valance! they were so pretty and the price was good. The swags came in after only a few days and were exactly what was described on the web site. I put them up, they fit perfectly, and they look great. ProsFast Delivery. Exactly as described on the website. I ordered 8 valances and they exceeded my expectations more than words can say. Beautifully made, designed, and a perfect match for my bedding. I just love them and can't stop looking at them. Great prices. Thanks for making me happy with this choice. ProsGood quality that hang well. ConsColor was described as burgundy but it is more coral which was a little disappointing. I am very pleased with my order. Ordering was easy and I received emails regarding status even that they had arrived and were in mailbox. All paperwork regarding returns were included with shipment. Very professional. Quality of product was everything I expected and they look great. I will order from them again. Although with my previous valance orders, they were much better grade material and craftsmanship. These valances had such an offensive odor. You will need to laundry or air out doors as I did. I hung these and was very satisfied with them. Glad I didn't return them. Love them and love the price! Excellent product and fast shipping. I will definately order from them again! ProsExcellent product and fast shipping. I purchased these for my kitchen and they look great! I love them so much that I purchased more to continue the look into the Dining Room. the valances arrived on time and I am satisfied with the quality. Planning to buy a couple more. No problem hanging it up. Beautiful valance. Valued price. Valances were more than expected. Love my valances and especially the colors! f\Fast shipping. And these are just perfect in my kitchen window. I am very please with the valances. I really like my valance. It blends perfectly with my bedspread & enhances my window! They look great in my kitchen! The curtains look like they do online. Good quality. Love the way they look. I ordered my curtains for the family room on a Sunday got them on the following Wednesday. They were just like the pictures. The colors are exactly what I wanted. I had to press them with a warm iron and they were ready to hang. They are sewn together very nice no raw edges, no skipped stitches. The material is very nice not flimsy. I will order more and I recommend Swags Galore to anyone. The prices can't be beat. I had looked for a couple of months for swags and valances and almost gave up till I found Swags Galore. ProsNice material well worth the money. Beautifully made. I love my new swags. They look so good hanging up and have ordered more for my bedroom and kitchen. Colors were exactly as pictured, quality material, very nice valances. Would highly recommend & Definately would buy again. ProsGreat valances for the money. I ordered the valances online and was a little nervous. It's hard to judge fabric and quality when you order online. They are beautifully made and exactly what I wanted. They look lovely. It is well made and not cheap looking. It looks very nice and I am happy with the look in my kitchen window. I am very happy with the valances I purchased. I have received so many compliments on them. Very satisfied. These balance were high quality and the best thing is the low cost. Have not had a chance to hang them as of yet but I love the quallity and look of them. This valance is absolutely a perfect color for my den; it accents the room very well. I needed a new window valance for my new windows and not only did I find what I wanted, but they were delivered in record time(just a few days)! I love the valances. It is just enough "curtain" not to look overdone. I am so pleased with the quality of theses valances for the reasonable price! They look great and stay in place with the ruffles since the material is thicker than most curtains twice the price!